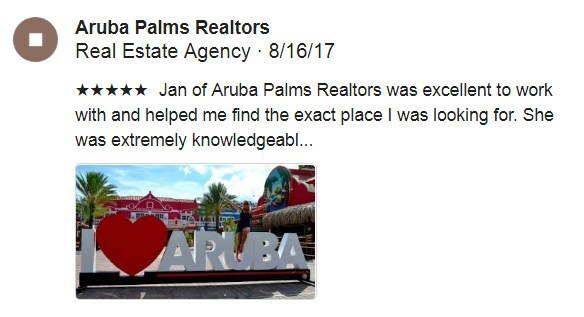 Aruba Palms Realtors has been featured on House Hunters International as a leader in Real Estate Aruba and Aruba Rentals. We pride ourselves in providing excellent customer satisfaction in selling, purchasing, or renting realty in Aruba. Aruba Palms offers a variety of services, including relocation, buyer and seller representation, worldwide marketing of listings including residential real estate, commercial real estate and land in Aruba. Aruba Palms Realtors offers extensive Aruba real estate listings to ensure you find the perfect home in addition, view our property rentals in Aruba, including residential and commercial spaces. Our team of agents is led by Jan Falcone, an industry veteran who is focused on finding you your dream home or your perfect Aruba vacation rentals. Whether you are searching for the perfect Aruba beach house or a large piece of land, Jan is the most sought after resource. Call now for an introduction to our company or to learn more about real estate in Aruba for sale, contact us today!